While walking in Boston during lunch time a day in September, a stranger recommended Massiminos's Cucina Italiana as an excellent place for lunch. Excellent? When looking back, I do not think so. Great location and reasonable price, but the rest of the experience was average. 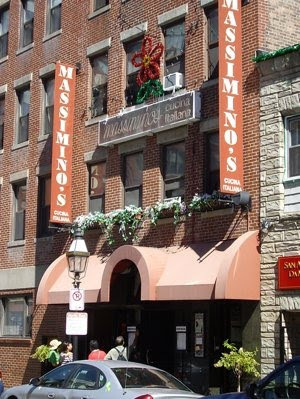 Massimino's Cucina Italiana is located in 207 Endicott Street, in Boston's North End, a short walk away from Faneuil Hall, Quincy Market and other attractions in the historic part of Boston. Endicott street is a typical street in this area, a narrow lane with colonial style red brick buildings lined along it. 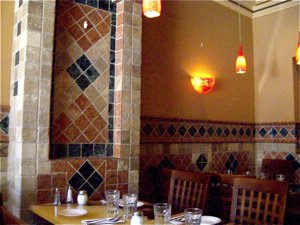 Massimino's Cucina Italiana has an interior found in a million other Italian restaurants around the world. Mustard coloured walls with marble and terracotta tiles, rustic lamps. A large number of wooden chairs and tables filled the room to capacity, and I would guess the room would feel over crowded during peak lunch and dinner time. It felt more like being in a bathroom rather than an Italian tavern. Tables nicely set with napkins, cutlery and glasses ready for the guest to arrive. I was, however the only to be there, as it had just opened for business, and one other guest arrived after me. I love gnocchi, and I was tempted to order the gnocchi al forno ($6,95) , and I did not have to wait long to be served. It looked appetizing enough. 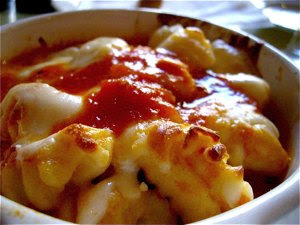 The gnocchi were served in an oven proof dish, and the dish had been prepared in a proper oven, as the gnocchi were delicately golden brown on top. Tucking into the bowl, I was first surprised and then disappointed. This was far away from the ultimate gnocchis. They had the strangest texture, possibly under cooked and they had a strange, sticky consistency. Gnocchis are made from flour, eggs and potatoes, and these tasted of flour with no additional seasoning. The tomato sauce did not taste much either, neither garlic, nor sufficient sugar or salt. I had to add more seasoning, and even asked for extra Parmesan in order to heighten the experience further. This did not, however, make the meal more memorable. Good location, but Massimino's Cucina Italiana is hardly the place for a memorable meal, or an interesting rustic Italian interior. Decent service and reasonable prices. Do not order gnocchi, but you may be more lucky with another choice from the menu. I, however, will not revisit.